When you run a primary and secondary sweep, there are multiple sets of traces for the same signal, where each individual trace represents a different value from the secondary sweep. 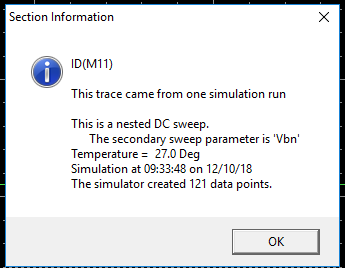 In OrCAD 16.0, I want to know which secondary sweep value produced a particular trace; how do I do that? So it tells me what generated that trace, but not the specific value of the secondary parameter that generated it. Am I doing something wrong? Should I be using parametric sweeps instead of and/or in addition to secondary sweeps? When you view the waveforms, you can right click on the trace, and click "Trace Information". This will show the parameter value used corresponding to that trace. To be honest im not sure how to read the sweep value then, but if you use "parametric sweep" instead, you can do as i described above. So you use "primary" and "parametric" sweep. Not the answer you're looking for? Browse other questions tagged simulation orcad or ask your own question. Problem of Convergence in simulating a model using Cadence Orcad 16.6 Pspice software? How to make a DC sweep with negative change in pspice orcad? Design pads and import to OrCAD PCB; or design directly in OrCAD PCB designer after importing other components?